It would be neat to see this when it tours the US. The project of bringing the Beaded VW Beetle to a museum came about as a result of the museum president’s visit to Miami. "We are constantly coming up with projects to raise money so that the museum can have exhibitions and be a lively museum,” said Cecilia Barbara de Moctezuma, president of the Association of Friends for the Museum of Popular Art. “Our president was in Miami attending an auction where a car decorated with little mirrors got a lot of interest and was auctioned at a very good price. When she came back to Mexico, she proposed us to come up with ideas on something that was 100 percent Mexican. 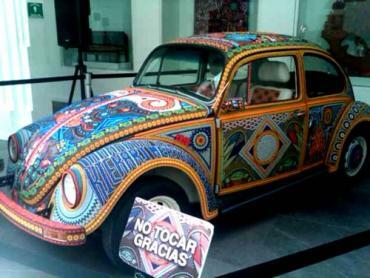 So to largely promote the work of the Huichol Indians to the world, we chose to decorate a Volkswagen."